We had to cross the Bayuda as well as the Nubian Desert in order to reach the town of Wadi Halfa at Lake Nuba (or Lake Nasser) – the “gateway” to Egypt. As the desert winds blew south in Sudan, we were driving only 65 km/h (or 40 mph) in third gear for hundreds and hundreds of miles across this huge country. In the deserts you cannot find any life except really tough creatures like camels. And sometimes you even notice some people who make their living along the highway. After crossing deserts and following the Nile downstream, we arrived in the Northern most town of Sudan, Wadi Halfa. From here we want to go to Egypt next. But normally we drive like 80 kph! Dear Domi, good luck with the Beetle towing the trailor !!! These little cars are really tough. Bonne route ! Your friend from San Diego. Pascal. 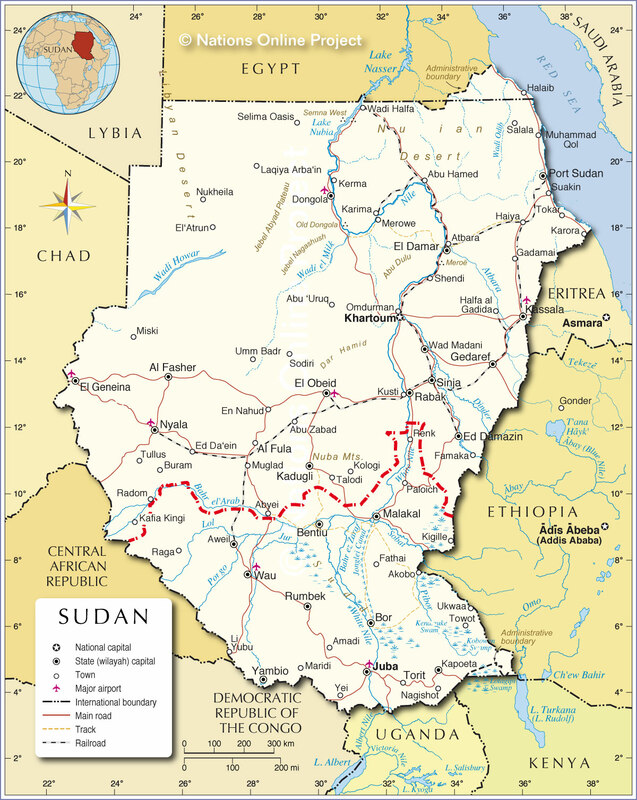 hi, map of Sudan, top right is the Nubian desert. Good to hear that everything goes ok.